A new German satellite rocketed into orbit from Kazakhstan early Monday, reinforcing a program to create the most precise civilian three-dimensional maps of Earth using dual high-resolution radars. The new spacecraft, named TanDEM-X, will fly in formation with a similar satellite launched in 2007 to illuminate Earth with two radars from slightly different vantage points in space. "TanDEM-X is a key German project and will provide us with a homogeneous 3D elevation model of the Earth, which will be an indispensable aid for a great many scientific and commercial avenues of inquiry," said Johann-Dietrich Worner, chairman of the German Aerospace Center, or DLR. The nearly 3,000-pound satellite, neatly packaged inside the nose of a Dnepr rocket, shot out of an underground silo and roared into space at 0214 GMT Monday (10:14 p.m. EDT Sunday) from the Baikonur Cosmodrome in Kazakhstan. 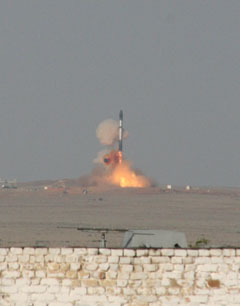 Powered by surplus Russian military hardware, the Dnepr rocket deposited TanDEM-X in a sun-synchronous polar orbit a few minutes later. German ground controllers heard the first radio signals from the satellite at 0245 GMT (10:45 p.m. EDT) through a communications station in Antarctica. TanDEM-X stands for TerraSAR-X add-on for Digital Elevation Measurement, according to DLR. TerraSAR-X has been collecting its own topographic images of Earth for nearly three years. The satellites will be separated by several hundred meters during normal operations, occasionally approaching within 200 meters, or 656 feet, of each other. Before controllers order TanDEM-X to enter formation with TerraSAR-X, they will check to ensure the newly-launched satellite is healthy. TanDEM-X uses autonomous formation flying software and GPS navigation readings to keep the satellites in lockstep and ensure they do not collide in orbit 319 miles above Earth. Engineers also added a cold gas thruster system to TanDEM-X for smaller maneuvers to keep the satellite positioned in the correct location. 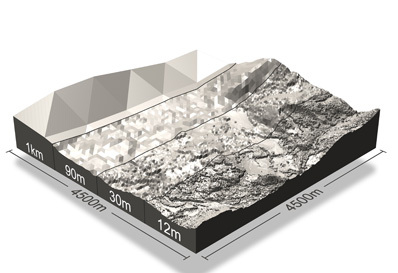 TanDEM-X is designed to work for at least five years, including a three-year overlap with TerraSAR-X. Both satellites carry X-band radars capable of accumulating enough data in three years to fill 200,000 DVDs, equivalent to 1.5 petabytes, or one-and-a-half quadrillion bytes. The radars can map Earth during day and night passes and see through clouds and precipitation. The twin radars work like a person's eyes, recognizing 3D scenes with stereo vision, while one eye only distinguishes two dimensions. 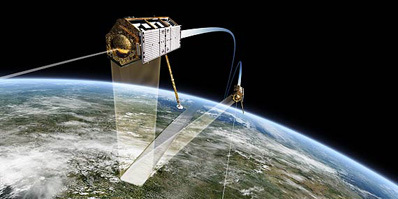 Both radars can emit beams of light toward the Earth's surface and measure the time until instruments aboard the satellites receive the reflected signals. Minor variations in that time tell the radar system information about the elevation and terrain on the surface. The mission's data will produce gridded maps with a spatial resolution of 12 meters, or 39 feet. The maps will show elevation with an accuracy of less than 2 meters, or 6 feet. "This will be the first time we will ever have had a globally standardized 3D digital elevation model of Earth, and with a measuring point density of 12 meters, it will be incredibly accurate," said Alberto Moreira, science director of the TanDEM-X mission. The tandem mission will survey all of Earth's land surface several times, gathering information to create topographic maps and digital elevation models for scientists and businesses. TanDEM-X's price tag of 165 million euros, or more than $200 million, is split among DLR and Astrium, the manufacturer of the satellite. "This mission demonstrates Germany's expertise in satellite-based radar technology and is, in particular, the outcome of a consistent focus in the national space program," Worner said. "Also, TanDEM-X demonstrates a successful public-private partnership." DLR is responsible for processing raw data streaming down from the satellites and distributing the information to scientific users. A private firm named Infoterra will disseminate data to commercial customers. Officials say Germany's digital elevation model, the first of its kind in the world, could be valuable in hydrology, oceanography, geology, disaster response planning, resource exploration, and national security applications. Germany plans to release the full data set in 2013.